Local artist Eric Mancini has a unique flair–and a heck of a story to tell. The Denton-born artist has made a name for himself on the local scene in recent years, partly for his unique talent, and partly for the fun he has with his art. Manciniâ€™s â€œTrumpsterâ€ piece–a pasting of Trumpâ€™s face on a Denton dumpster–earned the artist headlines back in January, but heâ€™s been stirring up controversy with his signature snarky art long before that. Now, Manciniâ€™s going solo with a Saturday, Sept. 29th show at the Stomping Ground Comedy Theater. 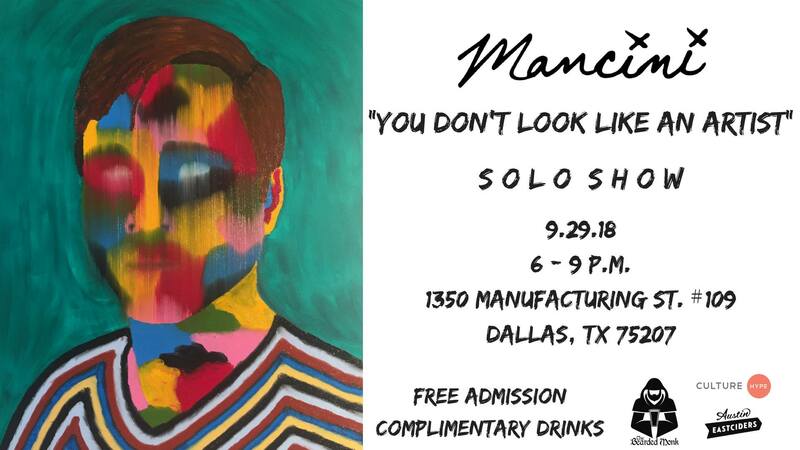 The show, an art gallery that displays his multiple styles alongside a comedy show, is a unique artistic offering worthy of a creator like Mancini. Born and raised in Denton, Texas, Mancini was fascinated by art at an early age. He honed his craft with no professional training, appearing in shows across DFW and painting murals in Denton and Dallas. His traditional style will be on full display in the show on the 29th, where heâ€™ll be joined by comedians â€œroastingâ€ his work & performing their own stand-up comedy sets.